Regeneration Water Storage Tank Installation, Iraq - 324,000 litres. 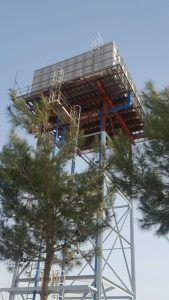 Manufacture, deliver and supervise installation of the water storage tank in Kurdistan. GRP Hot press insulated sectional tank with externally flanged sides & base 9x9x4m high. 9 x 9 x 4-meter-high sectional water tank to hold a nominal capacity of 324,000 litres. Iraqi Kurdistan officially called the Kurdistan Region by the Iraqi constitution, is located in the north of Iraq and constitutes the country’s only autonomous region. Kurdistan region has a population of an estimated 3 million people. Many works are ongoing in this area, large-scale regeneration projects were completed in late 2016 and further projects ongoing are scheduled for completion in 2017, all leading to aiding in the recovery of the area, improving economic stability by boosting employment and improving the area’s infrastructure & development. This project involved the assessment, manufacture, export of the tank, shipping documentation & installation supervision by a senior engineer at Dewey Waters. Our experienced logistics personnel organised the pre-shipment inspections and prepared export and import documentation on behalf of our clients ensuring a complete and hassle-free service. Our client required a water storage tank to hold a total capacity of 324,000 litres, the contract required installation at the top of a steel tower. 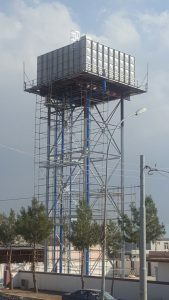 The water tower at this location consisted of an elevated structure built to support a water storage tank, it was constructed at a height sufficient enough to pressurise a water supply system for the distribution of potable water. The Tank panels & connections were dispatched on the 21st of November, once the tank was delivered in Kurdistan our client requested a change in connections sizes, this was processed efficiently and professionally by our sales & logistics team. Additional connections were manufactured and sent express via air freight. As standard, err on the side of caution our dispatch team send a spares tank kit with all export tanks to ensure each project runs as smoothly as possible in a timely manner. Part of the import/export package our logistics personnel supplied a European Certificate of Origin, a packing list and a material statement to satisfy custom and government officials in Iraq, our experienced logistics team have an understanding of custom requirements for shipping worldwide ensuring a speedy delivery. The client specification insisted that the product supplied was a hot press moulded tank which needed to conform to both British and Singapore water storage standards. A prerequisite required the tank to be tested up to six times the working pressure to satisfy the local councils. Once all documentation and certifications of testing were approved the construction took place in early January 2017. Our senior installation engineer travelled to Kurdistan to supervise the tank assembly. The objective, to oversee the operation, including delivery, construction, testing, this ensured our client the construction and quality of the tank were approved to British standards guaranteeing its longevity. Due to the tank construction taking place at a height of 20 meters, the base panels were craned to the top of the tower, once the base was completed the remaining panels and parts were craned up and placed in the middle of the tank, this meant that the crane could leave the site. Machinery time on site was kept to a minimum, providing our client with the most cost-effective solution. Some of the difficulties our engineer and partners experienced while assembling the tank included heavy snow storms and high winds which halted the tank construction efforts for a time. Due to the height requirements of the build, the health and safety of the crew were at the forefront of the decision process and building was stopped for a total of two days. Once the weather settled and it was deemed safe to continue the assembly crews which included six from the construction team, their supervisor, and finally, Dewey Waters Senior Engineer who supervised the overall operation commenced construction. Despite these conditions and setbacks, the construction of the tank was finished on time with a total build time of twenty days from start to finish, our site engineer was on site for the first and last week of the build. At Dewey Waters, we offer a deep understanding of the demands presented by international markets and conditions, our technical expertise, innovative manufacturing methods, extensive product range and a wealth of knowledge spanning 60 years, put us at the forefront of international water tank exports. By taking care of all documentation the process is as smooth and hassle-free as possible. We have an established reputation of which we are very proud of being one of the foremost international exporters of water tanks, housing/kiosks, and other GRP products. Nigeria, Croatia, Iraq, Luxemburg, Ascension Islands, Italy, Ghana, Egypt, Saudi Arabia, Barbados, Gibraltar, Azerbaijan.